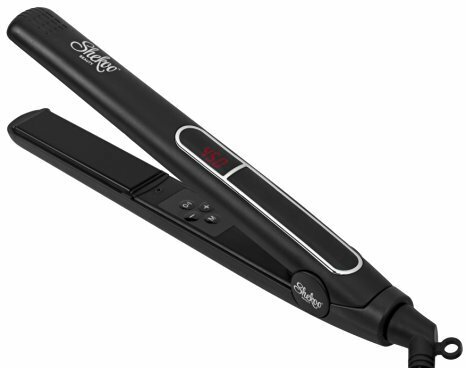 Shekoo Beauty sleek styling professional flat iron enhances your hair with a smooth silky shine. Featured with tourmaline ceramic plates to distribute heat evenly ensuring static and frizz free beautiful hair. Selectable heat levels making it the perfect styling tool for long, short, or any hair type. High heat range create more pronounced, lasting styles. Re-invent your look every morning for a constant boost of renewal. Shekoo 1 inch hair straightener is carefully designed to ensure your utmost safety and convenience. Shekoo Beauty, the brand providing you with the ultimate styling collection you deserve. 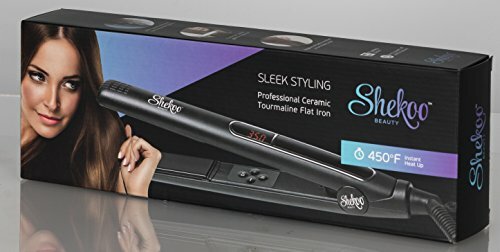 The Sleek Styling straightener proudly represents Shekoo fine styling. Our Quality is unbeatable and our buyer's satisfaction is our top priority. We carry high quality products that surpass any other styling tools in most amazing results, sleekness, heat range, convenience, safety, easy use, warranty, customer service, and much more. Treat yourself to Celebrity style hair care you know you deserve. Buy Better. Buy now. Be gorgeous. SLEEK STYLING: Anti-static salon professional straightener with ceramic plates reduces frizz and hair damage. Negative ions seal in moisture for healthy protected hairstyles. Create various styles straighten, curl, wave, or flip hair. Use with hair extensions for a perfect blend. ONE-BUTTON HEAT UP TO MAX: Speed up your styling using the one-button heat up to max. The iron will reach its highest heat level of 450°F within 60 seconds. Simply untangle hair with brush or comb. Apply heat protectant hair spray to avoid any hair damage and start styling immediately. SAY GOODBYE TO MESSY TRAVEL HAIR: Stay beautiful while traveling. The Shekoo flat iron is perfectly sized and compact to fit in your carry on/hand luggage along with your cosmetics and hair accessories. Stay beautiful and always look your best. GLIDE THROUGH HAIR WITHOUT PULL: Featured with floating plates effortlessly glide through hair without pull. LCD display technology offers clear view of current heat level. 11 selectable heat levels deliver perfect temperature for many styles. 360 degree swivel 9 foot cord avoids use of extension cords for a hassle-free experience. CONVENIENT STRAIGHTENING: The Shekoo flat iron is programmed to automatically turn off after 60 minutes when left unattended to keep your home safe and secured. Dual voltage capability for unrestricted use. (For international use, connect adapter).